Chances are, you've already heard of this gentle cleanser that so many people swear by! I was intrigued by claims that it works wonders, and so decided to put it to the test. As a big fan of Lush, I've been wanted to try more of their skincare products for a while. They advertise Ultrabland as a staff favourite, and most other reviews I've read are also very positive. It's supposedly suitable for all skin types, which I can well believe. I have sensitive, combination skin, and a lot cleansers tend to leave my face feeling either irritated or dried out. After using Ultrabland for almost a month, however, I can confirm that I've experienced neither of those things. My skin actually feels a lot more balanced! 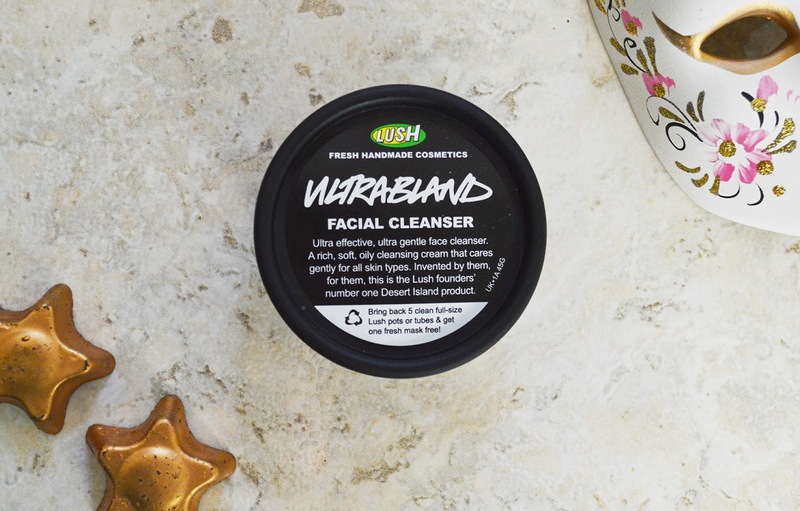 With natural ingredients like almond oil, beeswax and rose water, Ultrabland clings to make up and dirt, providing a deep cleanse without stripping away the natural defences of your skin. Some people dislike the fact that, after use, Ultrabland leaves a slight residue on your face. However, I think it is this layer of protection that prevents my skin from becoming too dry, and therefore don't mind it. It's as though Ultrabland is both moisturising and cleansing, win-win! However, if you don't like the left over moisture, removing the cleanser with a damp cloth, rather than cotton wool pads (as Lush recommends) should do the trick! I use Ultrabland nightly, and though it can be used without any other make up remover, I tend to use make up wipes first just to ensure my skin is thoroughly clean. As I mentioned in a previous post, I've also been using the No7 Cleansing Brush with Ultrabland every other night, and the combination of these two products has left my skin in the best condition it's seen for years! The dry patches I sometimes get in winter have virtually vanished, while other areas are significantly less oily and less blemished. Conclusion? I LOVE Ultrabland. It really is beatifully gentle, but still manages to provide a deep cleanse whilst helping to balance and hydrate my sensitive, combination skin. I honestly can't recommend Ultrabland highly enough. What do you look for in a cleanser? Have you tried Ultrabland or do you swear by another product? I'll love to know! Sounds like a perfect product! I definitely need to check this out! Thanks for sharing! I wanted to try it out for ages, and I think your review might have convinced me to finally give it a go!